Available in sizes to cover everything from walleye to salmon to muskies to striper, the Okuma® StrataMaster reels are made exclusively for Bass Pro Shops®. Aluminum anodized spool, smooth 2-bearing system, StrataMaster line counter (measures in feet), die-cast aluminum drag star, oversize power handle with ergonomic handle knob, multi-disc drag system for smooth and efficient fish-stopping power, corrosion-resistant 1-piece aluminum frame. "I'm buying 2 more of these, I am very impressed for the money. I use the 30 for big stripers and have had no problems with them for a year." 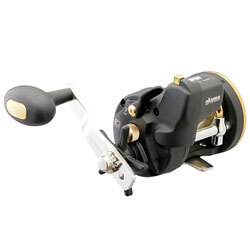 "These reels are a real improvement of the Okuma Magda Pro. The oval handle is much easier to hold onto when trying to reel in that lake trout and deal with your downriggers at the same time. "